Remember that the Theme and her colors combinations, is for a general public, and not for a specific public. If you like it, use it! Can you tell me what the font is you used for the logo or is it something custom? Hey Diego Andrés, I showed a friend this theme and she loves it. One problem that both she and I did notice on her site is that once logged in, we cant seem to locate a logout option. How's that? 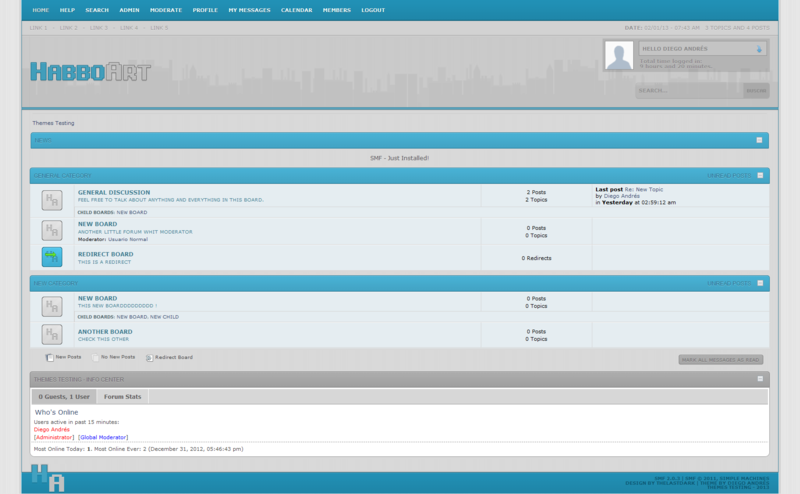 It can't be, try making larger the theme in the theme admin. It's a friends private, family forums. No big deal, we were just wondering where the logout was? I think he's suggesting that your Subs.php file is compromised in some fashion... though that seems unlikely. Subs.php checks out okay. No big deal, I simply added a logout button for her. It should be in there by default.